Due to unforeseen circumstances, production of this game has had to be put on hold until a later date. At this present time it is not certain whether Anzio will directly reintroduce The Great Train Robbery™ Board Game, or whether it is franchised out to another company whose expertise is with the games industry. 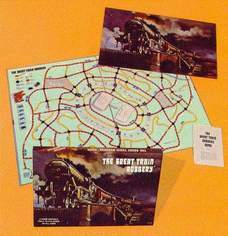 The Great Train Robbery™ Board Game is based upon the actual robbery that took place on the 8th August 1963 when the "travelling post office" train was hijacked at Sears Crossing, Buckinghamshire, England. - The train driver and co-driver were captured and the train driven a quarter of a mile to a bridge over the road. The mail carriages were ransacked by the gang and the 110 mail bags were thrown down to a waiting lorry. The gang then went to Leatherslade Farm, their base for the share out. This was only 20 miles from the hold up. Although based on the robbery, The Great Train Robbery™ Board Game has been adapted on a few small points, one being the extra farm house that was added for playing purposes. Also, on the actual robbery it was a diesel engine and this has been changed for a steam train, which shows more life and character, hissing steam and billowing smoke into the night sky. To capture this David Weston the famous train artist was commissioned by Bruce Barrymore Halpenny the Games inventor, for the painting for the Board Game showing The Great Train Robbery™. Here is a game that the family can play using skill, judgement, initiative and of course that important element of LUCK.